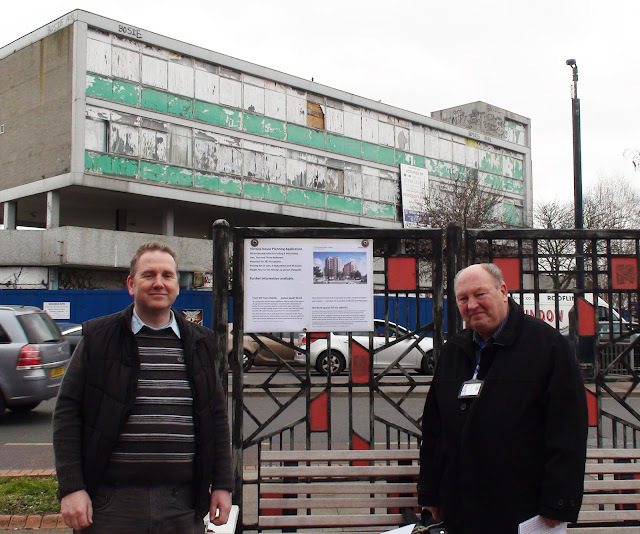 Yesterday I spent a short while with Alan Plant (Chapra Chair) and others across the road from Victoria House gathering petition signatures against the proposed new development of Victoria House. This might come across as a bit of an anomaly, given the state of the current Victoria House building. But whilst it would be easy to accept any development as being better than what is currently there, we don't want to end up with another awful situation for the next 50 years and unfortunately the proposed new development (left) which will be there for many decades to come, is not nearly good enough for the local area for several reasons. 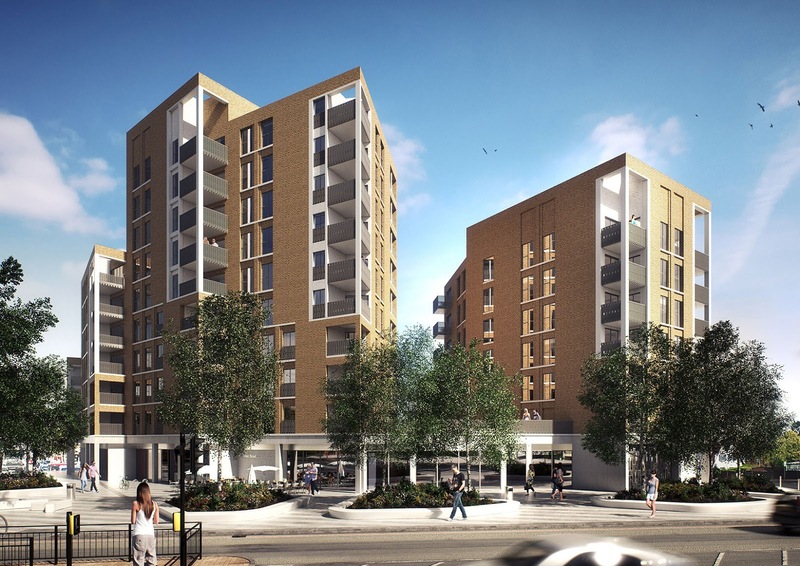 Firstly, as a collection of tower blocks it is an ugly design that is completely out of keeping with the art deco architecture on the three other corners of this major North Cheam intersection. 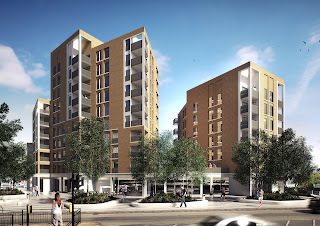 Secondly and perhaps more importantly, with 90 residential units and only 55 car parking spaces (of which 10 are shared with the public), the new design does not offer anywhere near enough car parking for the number of people that will be living there. People generally do not just give up their cars when moving into a place without dedicated car parking and so it is expected that additional cars will be parked in the surrounding streets. 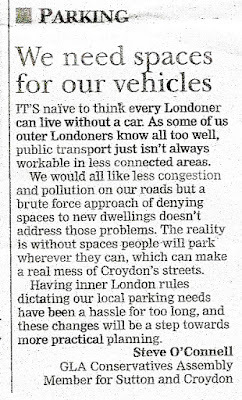 Our London Assembly Member, Steve O'Connell put it rather well in this letter (right) from the Croydon Advertiser on February 19th about a similar issue in Croydon. Anyone who lives anywhere near the proposed collection of tower blocks knows that there is very little scope for additional parking in the area. One of the nearby streets, Wellington Avenue, which a council report suggested could accommodate extra cars from the development already has controlled parking areas and yellow lines and is in no way in a position to accommodate more cars. Lingfield Road is in a similar position. It so happens that McMillan House, the large building on the left as you approach the North Cheam lights from WP, has been undergoing conversion from offices to residential accommodation and several hundred people are expected to move in here. 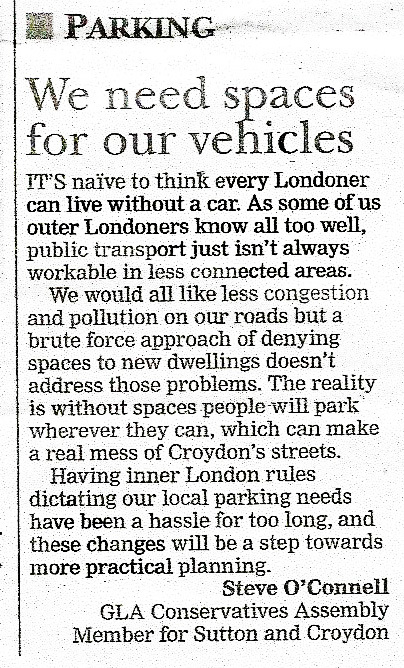 This will also add to the number of cars needing somewhere to park in the local area. McMillan House, being a direct conversion from office space to residential was not subject to development control is the same way as many conversions require as there were no planned changes to the exterior or structural work. 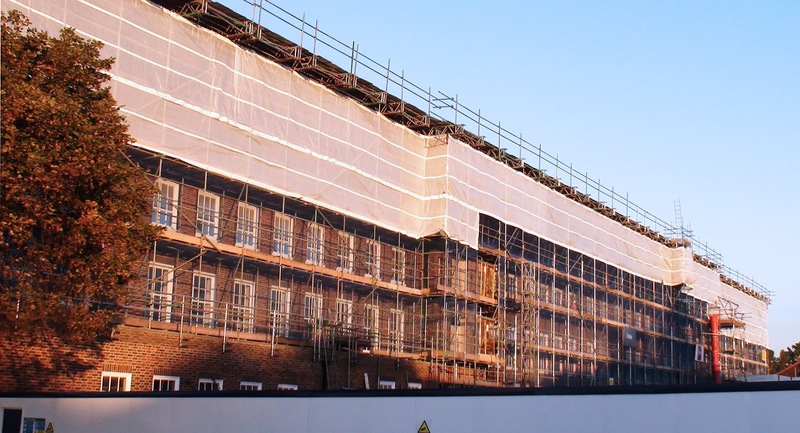 It therefore falls under permitted development, which makes it harder for the council to insist on addition parking space or other alterations. So with a large number of extra cars expected in the area, a large development that greatly contributes to that additional number, needs to provide at least enough parking to accommodate it's own share of the increase. The new proposal simply doesn't do this. Ideally, given Victoria House's position at North Cheam cross-roads, in the middle of a retail area, it should also provide car parking to help shoppers shop locally. The previous planning application did exactly this which was one of the reasons I supported it. It offered time limited parking for shoppers which reverted to unlimited parking in the evenings for guests and visitors. 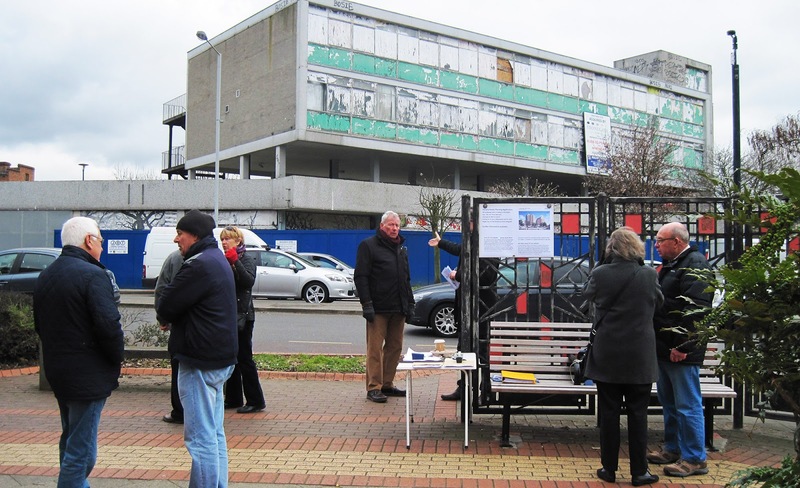 This new application, which can be seen on the council website, does provide 10 public spaces but with only 45 spaces provided specifically for the residents, it is expected these spaces will be almost constantly taken up by either residents or employees of the retails shops on the ground floor. There are planned spaces for 3 motorbikes and a whopping 96 bicycles, and while I am all in favour of cycle parking and encouraging people to cycle, I suspect that the 96 spaces might include a large dollop of wishful thinking. For those who would like to sign the petition, Steve in Steve's Card Shop is looking after it so you can just pop in and sign next time you are passing by.